Attention all “Modern Vixens”…….don’t miss out on the stunning pop culture, retro and horror themed jewelry available at Laughing Vixen Lounge. This jewelry collection is so unique and creative and there are lots of pieces that I loved at first sight. From charm bracelets, pendant necklaces, compacts, pill boxes, rings and more there is sure to be something special for you to choose from at Laughing Vixen Lounge. 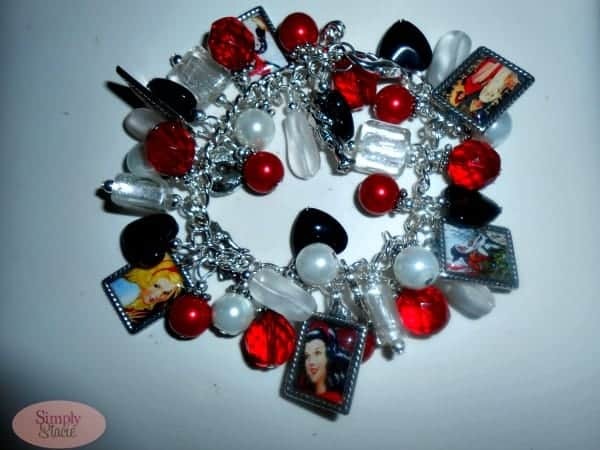 The Snow White and Rose Red Photo Deluxe Charm Bracelet ($50) is absolutely gorgeous. Featuring vintage Brothers Grimm Snow White and Rose Red images on six stunning silver plated photo charms, each charm is covered with hand-poured resin for a lovely glass like finish and I really appreciate how each image is so detailed and clear. There are six additional charms including characters from the classic fairy tale such as Snow White, Rose Red, Dwarf, Prince, Bear and the Treasure Chest. 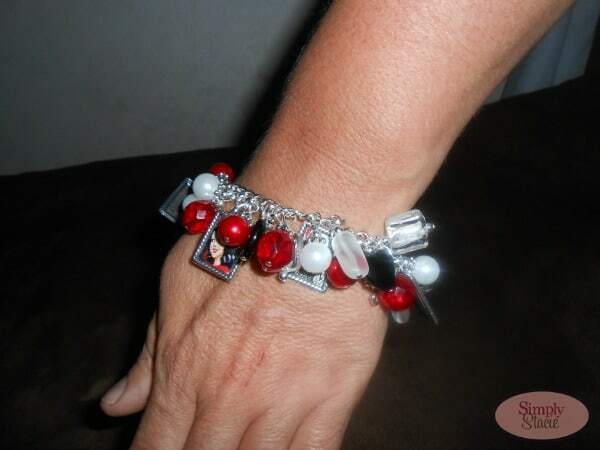 It is adorned with pretty glass pearls in frosty white and deep, rich red. It is accentuated with glass heart beads in jet black and frosty white glass foil beads. The jewelry designer has even added her trademark little bells on the last loop showing an attention to detail and a talent for jewelry making. This 7 ½” bracelet (it can fit up to 8”) is durable and I love that it has a sturdy lobster claw clasp to keep it in place. I love charm bracelets and have several in my jewelry collection but this one is by far my favorite in terms of contrast in colors, creativity and overall beauty. In addition to this charm bracelet there are many others pieces in the Laughing Vixen Lounge collection that are really show stoppers including the vintage-retro inspired Mother’s Pendant Necklace ($12) which would be nice for Mother’s Day and the Louisiana Vampire Deluxe Charm Bracelet ($32) perfect for fans of this genre. You are invited to visit the Laughing Vixen Lounge Etsy Shop to browse the entire collection of unique, pretty jewelry. “Bangles, baubles and other needful things for the Modern Vixen” is the proud statement for this jewelry collection and it is the perfect way for you to accessorize with a few truly special pieces that are high quality, attractively priced and sure to get lots of attention. Head on over to the Laughing Vixen Lounge blog and enter the Murder Mystery Scavenger Hunt Giveaway for a chance to win a $50 gift certificate! (Giveaway runs from April 12-April 28th). Connect with Laughing Vixen Lounge on Facebook and Twitter too! One lucky reader will receive a $50 gift certificate to use at the Laughing Vixen Lounge Etsy Shop! I like the zombie apocalypse bracelet. I really like the ocean jewelry bracelet! I love the Ocean Jewelry – Ocean Blue Charm Bracelet – Ocean Bracelet – Beach Jewelry – Sea Bracelet – Sea Jewelry – Beach Bracelet! I love the Butterflies and Dragonflies Charm Bracelet.